Later this week I'll be posting a small Blackwork sampler I made for Single Colour Stitching theme on the &Stitches blog. Well the technique is Blackwork but my little sampler is made with different shades of green instead of black as I was allowed to use any colour except black. I found much inspiration in these two books from my personal 'library'. 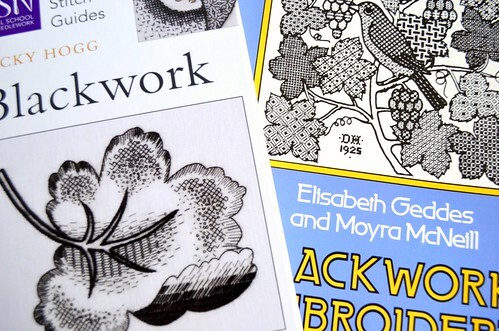 I even purchased another Blackwork book on Ebay yesterday. Anyway, my small sampler was stitched on 14 count aida but I wanted to raise the bar and try stitching on a higher count even weave fabric. 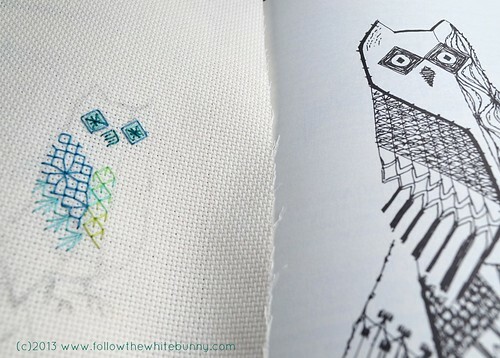 I found some 18 count aida (at least I think it's 18 count) in my stash, made a not very accurate copy of an owl I found in the book you see on the right and continued exploring blackwork in blue and green this time. The owl looks kind of spooky but then the example is a bit strange at well. ;) If you want to try Blackwork too you can find some simple templates (same ones I used for my small sampler) and useful links here. I just bought that RSN book, too.